Tropical Storm Florence, now spinning some 1,500 miles from North Carolina’s Outer Banks, “is forecast to be a dangerous major hurricane near the southeast U.S. coast by late next week,” the National Hurricane Center said Saturday. “Many areas in Missouri, Illinois and Indiana will continue to see a risk of flooding during the day Saturday,” said AccuWeather meteorologist Ryan Adamson. Some spots could see a half-foot of rain over the weekend, according to the National Weather Service. In South Carolina on Saturday, Gov. Henry McMaster also declared a state of emergency due to the possible impacts from Florence. No evacuations have been ordered yet, however. 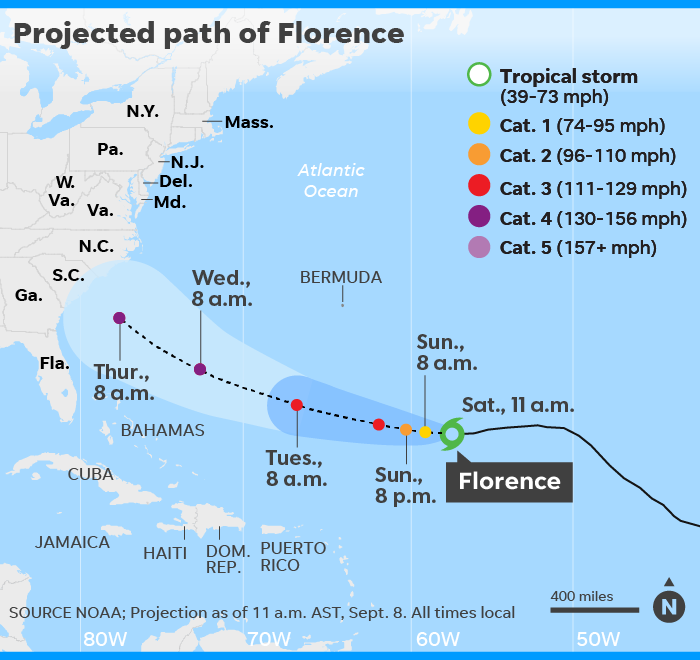 As of Saturday afternoon, Florence had winds of 70 mph and was crawling to the west at 5 mph. The center of the storm was about 810 miles southeast of Bermuda.